Vatican.va Release: When on October 20, 1958 the cardinals, assembled in conclave, elected Angelo Roncalli as pope many regarded him, because of his age and ambiguous reputation, as a transitional pope, little realizing that the pontificate of this man of 76 years would mark a turning point in history and initiate a new age for the Church. He took the name of John in honor of the precursor and the beloved disciple—but also because it was the name of a long line of popes whose pontificates had been short. In 1921 he was called to Rome to reorganize the Society for the Propagation of the Faith. Nominated titular archbishop of Areopolis and apostolic visitator to Bulgaria (1925), he immediately concerned himself with the problems of the Eastern Churches. Transferred in 1934 to Turkey and Greece as apostolic delegate, he set up an office in Istanbul for locating prisoners of war. In 1944 he was appointed nuncio to Paris to assist in the Church's post-war efforts in France, and became the first permanent observer of the Holy See at UNESCO, addressing its sixth and seventh general assemblies in 1951 and 1952. In 1953 he became cardinal-patriarch of Venice, and expected to spend his last years there in pastoral work. He was correcting proofs of the synodal Acts of his first diocesan Synod (1958) when he was called to Rome to participate in the conclave that elected him pope. In his first public address Pope John expressed his concern for reunion with separated Christians and for world peace. In his coronation address he asserted "vigorously and sincerely" that it was his intention to be a pastoral pope since "all other human gifts and accomplishments—learning, practical experience, diplomatic finesse—can broaden and enrich pastoral work but they cannot replace it." One of his first acts was to annul the regulation of Sixtus IV limiting the membership of the College of Cardinals to 70; within the next four years he enlarged it to 87 with the largest international representation in history. Less than three months after his election he announced that he would hold a diocesan synod for Rome, convoke an ecumenical council for the universal Church, and revise the Code of Canon Law. The synod, the first in the history of Rome, was held in 1960; Vatican Council II was convoked in 1962; and the Pontifical Commission for the Revision of the Code was appointed in 1963. His progressive encyclical, Mater et Magistra, was issued in 1961 to commemorate the anniversary of Leo XIII's Rerum novarum. Pacem in terris, advocating human freedom and dignity as the basis for world order and peace, came out in 1963. He elevated the Pontifical Commission for Cinema, Radio, and Television to curial status, approved a new code of rubrics for the Breviary and Missal, made notable advances in ecumenical relations by creating a new Secretariat for Promoting Christian Unity and by appointing the first representative to the Assembly of the World Council of Churches held in New Delhi (1961). In 1960 he consecrated fourteen bishops for Asia, Africa, and Oceania. The International Balzan Foundation awarded him its Peace Prize in 1962. Since his death on June 3, 1963, much has been written and spoken about the warmth and holiness of the beloved Pope John. Perhaps the testimony of the world was best expressed by a newspaper drawing of the earth shrouded in mourning with the simple caption, "A Death in the Family." 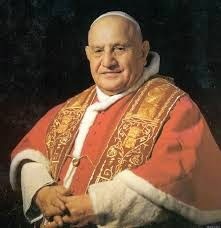 Official Prayer to St. John XXIII Dear Pope John, Your simplicity and meekness carried the scent of God and sparked in people’s hearts the desire for goodness. You spoke often of the beauty of the family gathered around the table to share bread and faith: pray for us that once again true families would live in our homes. With outstretched hands you sowed hope, and you taught us to listen for God’s footsteps as he prepares a new humanity: help us have a healthy optimism of defeating evil with good. You loved the world with its light and darkness, and you believed that peace is possible: help us be instruments of peace at home and in our communities. With paternal gentleness you gave all children a caress: you moved the world and reminded us that hands have been given to us not for striking, but for embracing and drying tears. Pray for us so that we do not limit ourselves to cursing the darkness but that we bring the light, bringing Jesus everywhere and always praying to Mary. Amen.